Every now and then scientists come across several incidents which leave us with eyes wide open in bewilderment. 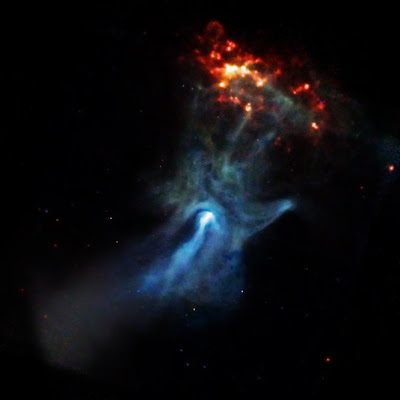 Recently NASA released a photograph of Hand of A Young Pulsar PSR B1509-58. It literally looks like a giant cosmic hand. A small, dense object only twelve miles in diameter is responsible for this beautiful X-ray nebula that spans 150 light years. At the center of this image made by NASA’s Chandra X-ray Observatory is a very young and powerful pulsar, known as PSR B1509-58, or B1509 for short. The pulsar is a rapidly spinning neutron star which is spewing energy out into the space around it to create complex and intriguing structures, including one that resembles a large cosmic hand. According to astronomers the pulsar B1509 is 17000 light years away and about 1700 years old. It’s a Neutron star which rotates about 17 times every second and releases energy into its environment at very high rate. It’s said to have 15 trillion times stronger magnetic field than earth. This rapid rotation and strong magnetic field makes it the most powerful electromagnetic generators in the Galaxy. The spewing energy from the rapidly spinning neutron star has taken the shape of this hand.